We were pleased to attend this year’s Innovyze UK and European Conference in Birmingham over two days, 12th and 13th March. Following a soggy start thanks to a downpour as soon as we came out of the station (the irony was not lost on us there! ), we attended the Sewer, Storm and Flood Modelling stream. 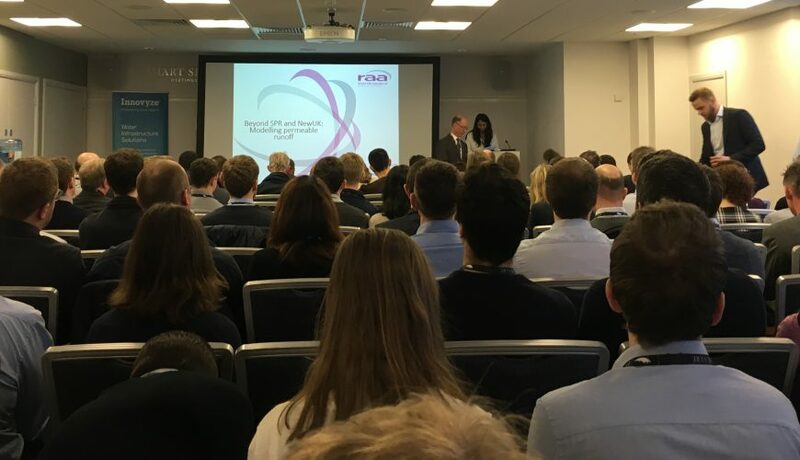 Directors Martin Allitt and Kerry Foster were there, along with two of our graduate hydraulic modellers, Rhitu Ghiri and Hanna Kugachandran, with Hanna presenting in the first technical slot of the day. Hanna’s presentation “Beyond SPR and NewUK: Modelling permeable runoff” looked at and compared different runoff methods and what factors should drive our permeable modelling methodology. The topic was well received with many commenting on how informative Hanna’s presentation was and it also set the scene nicely for a presentation later in the day on Rainfall Runoff Modelling. The second day of the conference was attended by two members of staff from our Northern Office, John Hilson, Director and Gary Buck, Principal Hydraulic Modeller. Thanks to Innovyze for a most useful conference and the chance to catch up with many of our clients and colleagues. What a great write up. Thank you Kelly and to all of our friends at RAA Ltd who helped make the event a resounding success. Hanna’s presentation went down very well indeed, and we are delighted to provide a platform to help the next generation of modellers. We really appreciate the generosity of everyone who presented and look forward to welcoming you to future events.